Abelssoft WashAndGo 2009 is an easy to use utility software for Windows operating system that able to clean up, organize, and speed up system to ensure maximum PC performance. Abelssoft WashAndGo 2009 comes with registry repair tool, junk file remover, a suite of privacy tools, error repair tool and vulnerability scanner. In addition, it can enable users to simply and easily clean their PC hard disk, freeing disk space and speeding access to important data by removing garbage files, temporary files, Windows Registry entries, duplicate DLL libraries, superfluous, outdated service pack files, and uninstall entries. Furthermore, WashAndGo can download security updates automatically to keep WashAndGo updated all the time. 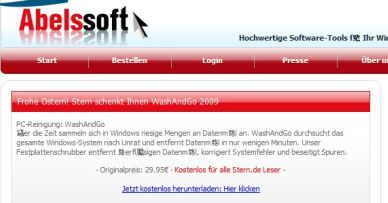 Click on “Jetzt kostenlos herunterladen: Hier klicken” to download the free full version Abelssoft WashAndGo 2009. Install the Abelssoft WashAndGo 2009 and run the program. A web page for registration will be open automatically, where users need to fill in the form, enter the email address, first name, last name, and click Get Free unlock code button to get the free license key code. After fill in the form, Abelssoft will send an email with Abelssoft WashAndGo 2009 free full version registration key. Enter the license key received to unlock the program as full version. Abelssoft WashAndGo 2009 supports Windows XP, Windows Vista and Windows 7.